We have some uplifting news to brighten any bird-lover’s or conservationist’s day! “Wisdom,” a 64-year-old Laysan Albatross, has returned to her home on Midway Atoll, Hawaii to nest after a year of absence. Laysan Albatrosses are migratory birds and spend much of their time in the air until they settle on a remote island in groups to lay eggs. Found to be happy and healthy at her home on Midway Atoll, Wisdom is a symbol of hope and inspiration in the face of seabird decline. She has already raised 36 chicks and we’re still counting! It is gratifying to see her return because of the decades of hard work conducted to manage and protect albatross nesting habitat. Laysan Albatrosses can live for a very long time, but their lives can be cut short by invasive species. 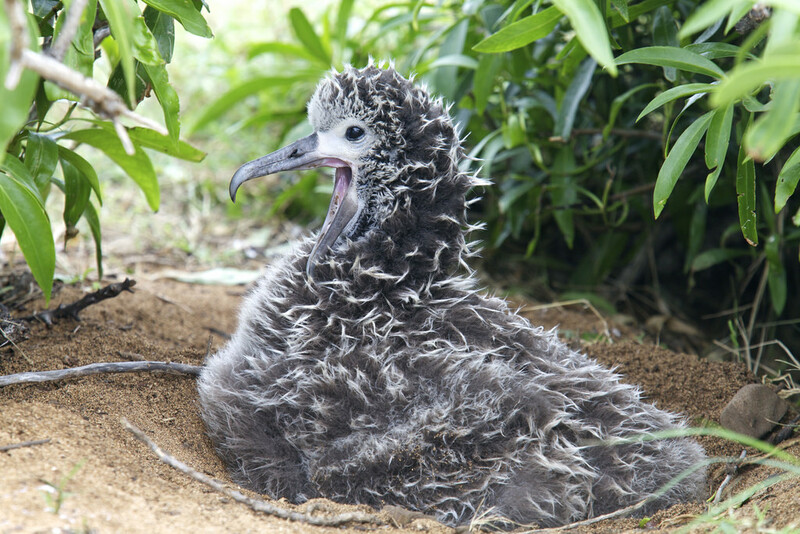 Laysan Albatross eggs and chicks can fall victim to invasive rats. UPDATE: Wisdom Hatches her 40th Chick!